The SR Portamento features an extended 30-fret Rosewood fretboard for playing in upper registers usually only accessible on an upright. The SR Portamento features 5-piece Maple/ Bubinga through-neck for increased sustain and superior tone. On the back of the SR Portamento are recessed controls assigned to each individual string to control the volume of the Ibanez-exclusive AeroSilk Piezo pickup. Perfect string balance and response can be achieved by adjusting the volume to accommodate different string gauges. The Custom bridge is created specifically for the optimum performance of the AeroSilk Piezo pickup system. Unique plastic saddles were designed to work in concert with the piezo pickups and enhance the acoustic "stand-up" quality of the sound. The MK-1 pickups are a split coil design that provides a very wide frequency range and enhanced definition for maximum accuracy. The Neck and bridge pickups have equal response, like traditional single coils, but without the hum and noise. The EQ section incorporates the controls of the Bartolini pickups with the AeroSilk Piezo system. 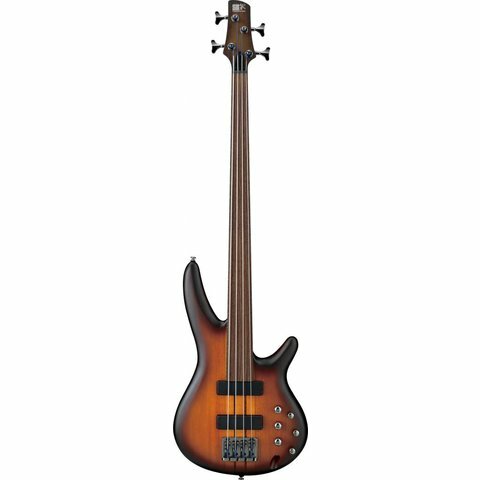 Controls include a Master volume, balance and bass & treble controls for the Bartolini MK-1 pickups and a Master volume and a tone control for the Piezo system.